I saw Toy Story 1 when I was young. So it always remains a familiar image. Toy Story 3 was never seen. I was delighted to see this. First of all, Toy Story seems to be a good movie. I don't like animation much, but I think there is a feeling that animations can only give me a feeling. And I think there is a feeling that animations are eloquent. It's just joy. Their smiling face is a bright face. Some people think that they are smiling, but others do not. However, I think the smiling faces of the animation characters are smiling. In particular, the stories that they might experience as toys and experience in the movie have created a smile. The animations seem to be sympathetic. Most animations can be seen as children, and they seem to be easily understood and empathetic. Especially, I could be more sympathetic. Because I’m college students like Andy. Toys are precious to Andy. To me, I wondered what was precious to me. It may not necessarily be a toy. It could be a person who has a neglected relationship. The feeling of alienation caused by negligence is regrettable and sad. There are many reasons why relationships slip, but I was busy. I have a friend who is a best friend. I became a university student and my friend goes to the United States to study abroad in summer. Because she goes abroad, there are not many days to share in Korea. So I planned many things. However being a college student, I became so busy. So, many of our plans fell apart. When I was a college student, I knew I'd have a lot of time. The reality of college students was too hectic. Therefore, the relationship with friends decreased and the time spent together decreased. I felt sorry for my friend. Friend understood my position, but she would have felt upset. I felt like I was Andy. Andy would feel sorry for Woody and his toys. Andy became a college student when he was already big. It is impossible to play with toys. Since he no longer looked at them, Woody and the toys would have been disappointed. It seems scary to have neglected the relationship. However, it seems to be inevitable if it is due to changes in the environment. To attract Andy's attention, toys hide his cell phone. I felt their lonely feelings. Ken and Bobby fall in love at first sight. I was excited at the moment. When toys try to escape, I can feel tension. There is tension in suspense over any kind of thrillers or pursuit. Rasso's dictatorship creates fear. There is a danger of dying at the disposal site. Then they hold hands together and rely on each other. It was touching. And when Andy and Woody say goodbye, they are so touching and sad. Andy says this before he says goodbye. “Now you got a promise to take good care of this guys...They mean a lot to me... You think you can take care of him for me?” At this time, I almost shed tears. Through their farewell, the break-up soon dawned on the start of a new start. Through events that exert imagination, this movie conveys a lot of emotion and conveys a feeling of genuine emotion. Toy Story, which conveys pure emotion, seems to be a film worthy of recognition. After watching this movie, there is a yearning for memories. Everyone would have imagined that my toys would move alive when I was not there. This movie seems to be the only movie that connects my mind and my mind when I was young. 'Don't lose precious things for the sake of your years.' I learned this lesson. 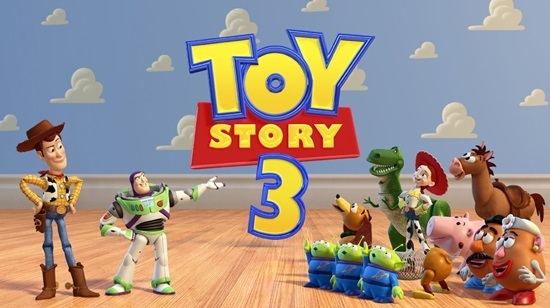 Although I had never previously seen Toy Story 3, I saw Toy Story 1 when I was young. Because of this, the third Toy Story seemed very familiar to me and I was delighted at the chance to see it. First of all, Toy Story 3 is a good movie. Even though I don't like animation all that much, I think these films convey a unique feeling that only they can give. Animations have a simple eloquence that is just joyous. Above all, the characters’ smiling faces are bright and happy. Some people think that they are genuinely smiling, while others do not. However, I think the smiling faces of the characters are actually really smiling sincerely. But beyond the bright faces, I think it is their experiences as toys and the situations they go through in the movie that bring a smile to my face most of all. Many animations develop sympathetic feelings within their audience. Because most animations are seen by children, they need to be easily understood and empathized with. But in this case, I felt I could especially relate because I’m a college student, just like the main character Andy. Toys are precious to Andy. This made me wonder what is precious to me. In my case, it may not necessarily be a toy. It could instead be a person with whom I had neglected a relationship. The feeling of alienation caused by negligence in relationships is regrettable and sad. There are many reasons why relationships slip, but one reason for me in my life is that I became busy. When I started university, my best friend went to the United States to study abroad over the summer. Because she went abroad, we didn’t have many days to share together in Korea. So, even though we planned many things to do together, our plans fell apart. I thought that as a college student I would have a lot of free time. In reality, the life of a college student is very hectic. Therefore, my relationships with friends have suffered and our time spent together has decreased. I felt sorry for my friend that went abroad. Even though, my friend understood my position, she might have felt upset. So, in this way, I felt like I was Andy. Andy would have felt sorry for Woody and his other toys if he had known what was going to happen to them. Since Andy had now grown up and become a college student, it was impossible for him to play with his old toys like before. Because he no longer paid attention to them, Woody and the toys were disappointed too. Although it is sad that their relationship suffered, it seemed to be inevitable due to changes in circumstance and environment. There were other important moments in this movie that I enjoyed as well. When the toys hid Andy’s cell phone to attract his attention, I really felt their loneliness. When Ken and Barbie fell in love at first sight, I was so excited. When the toys try to escape, I could feel tension and suspense. Lotso’s dictatorship over the other toys was quite scary as well. Especially when the toys were in danger of dying at the disposal site. When they held hands together and began to rely on each other, it was touching. And when Andy and Woody say goodbye, they showed real feeling and sadness. Before they part, Andy says, “Now you got a promise to take good care of these guys...They mean a lot to me... You think you can take care of him for me?” During this scene, I almost cried. Through their farewell, we realize that this is not just a goodbye but a real break-up. Through these many events, this movie conveys a lot of genuine emotion. For this, Toy Story 3 is a film worthy of recognition. After watching this movie, I felt a yearning for memories. Everyone at some point has probably imagined that their toys were alive when they weren’t there to see what was going on. Similarly, this connects my mind to the thoughts and feelings I had when I was young. There’s a famous expression, “Don't lose precious things for the sake of your years.” This movie really taught me this lesson.